We’re straying from the British landscape for a moment to look at how beautiful geological maps can be. I’m indebted to the website of Pruned which has extracted these maps from enormous PDF archives of the original reports. In 1944, Harold N Fisk prepared a report on his geological investigation of the lower Mississippi River valley. The Mississippi - the fourth longest river in the world - ends as a delta, where it dumps amazing quantities of sediments into the Gulf of Mexico. Before it gets there, however, it has a long and rather ornate meander along the border of the American state that bears its name. 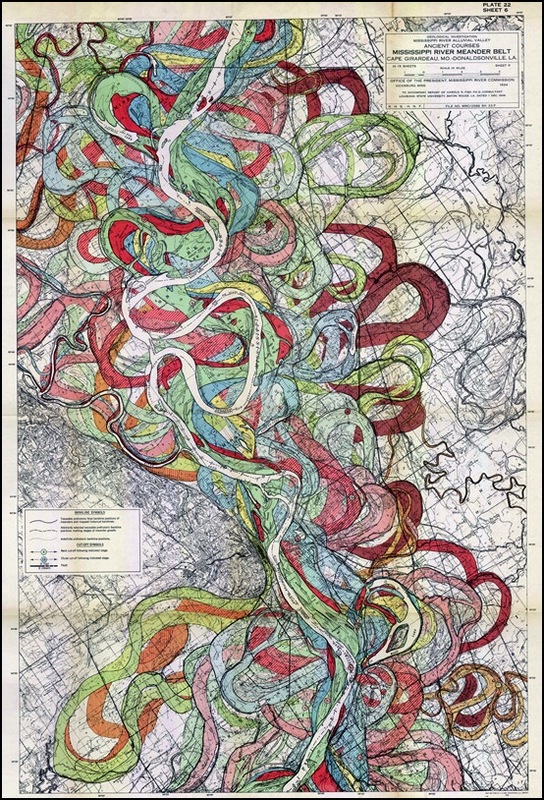 Slow meandering rivers alter their flood plains perhaps more rapidly than any other alluvial process - and this can be seen in Fisk’s rather rococo-looking maps. Baroque curves lend an almost art nouveau quality to these maps. Proof, if it were needed, that art really does reflect life.